Unlike the swank offices in business districts of its venture fund peers, VenturEast's office is a quaint house in an eastern suburb in Chennai, complete with a sun deck in the garden. Its previous occupant was film director Mani Ratnam. In Hyderabad, where a VenturEast biotech fund is based, the office is in a sprawling ancient house. "We are trying to be different in everything that we do," says Sarath Naru, the genial Managing Partner of VenturEast . The difference was visible right from day one. In 1997, Naru and his founding team acquired the erstwhile Andhra Pradesh Industrial Development Corporation's (apidc) venture fund in a privatisation exercise, building a $10 million fund - apparently the only such instance in India. Since then, the company has evolved into two entities with separate funds, investors and teams: VenturEast in Chennai and VenturEast-apidc at Hyderabad. The two teams are led by Naru - and share a chief financial officer besides human resources (hr), administrative and tech staff - and keep close to their core competence of spotting promising early stage companies. As co-founder Raghuveer Mendu says: "We like doing early stage. That is our knitting. We enjoy it and we see good returns." For portfolio companies such as Richcore Lifesciences this focus matters. Founder Chairman and Managing Director Subramani Ramachandrappa, 36, an Indian School of Business (ISB) graduate, had discussions until the last stage with a few funds before picking VenturEast. It turned out a good choice. Two months into setting up a factory in 2010, he realised he needed another $1 million. "Any other fund manager would have created a furore. The VenturEast team figured that my efforts were sincere and they were willing to risk more." A bridge loan prevented significant equity dilution. VenturEast's narrow focus on early stage deals means that the team size remains small - it runs its Chennai and Hyderabad operations with six partners. There is significant effort at keeping the work environment easy and effortless. As Mendu says, the team is "type A but collegial". 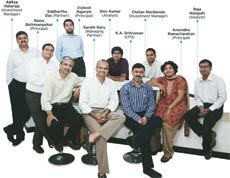 As the founding team completes 15 years, there is an effort at grooming second rung leaders - five of whom have been shortlisted. Not all bets go right even with the best fund managers and VenturEast has had its share of wrong calls. For instance, it bet on a company playing in wireless access protocol services, a technology that died an early death. In the case of a pharma retail company, "we let the management run too fast before the unit level model was proved", says Naru. A shortcoming with the VenturEast model, says an expert who tracks the venture industry, is that "it is too regional". Naru deflects saying the business demands that VenturEast be close to its companies. However, most other industry watchers are far more generous. "VenturEast has done well consistently over 15 years," says one of the limited partners who does diligence on the funds on a regular basis.